Notice plates are a building regs requirement. Many customers contact us wanting to make changes to their flue systems or install new stoves. A lot of time is saved when identifiying the type and size of flue if the notice plate has been displayed as it should be. 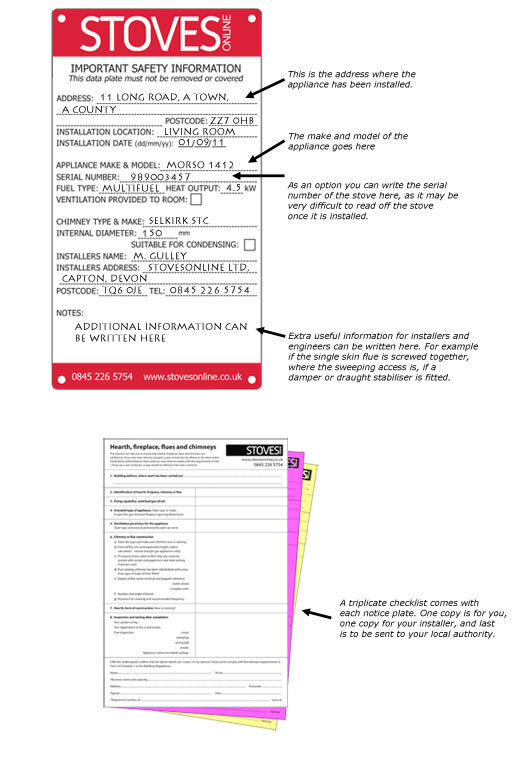 A notice plate must be completed and permanently posted in the building when hearths or flues have been installed. This then applies to stove installation, chimney lining, hearth installation, twin wall flue pipe installation, pumice liner installation, concrete liner installation, and in many other instances. The notice plate shows the position of the hearth and/or flue and gives essential information about the materials used such as the manufacturer and flue diameter. We have our very own, rather posh we think, Notice Plates and checklists. The notice plate is durable metal and comes with a checklist in triplicate. One copy of the checklist is for the installer, one is for the homeowner and one for the local authority. The checklist is already hole punched which makes it handy - for all our installations we simply keep the checklists either in a shared folder or in that particular client's folder: simple. The checklist is based on Doc. J appendix A and helps to ensure that the installation are satisfactory. Copies should be offerred by the installer to the customer and the Building Control Body. If subcontracting then a copy should be given to the main contractor. Our notice plate and checklist is only £8.50 inc VAT. We also carry other manufacturer's notice plates and checklists. For example if we are sending out an entire Isokern pumice chimney system then we may well include the matching Isokern notice plate and checklist.